March 30  In a world that celebrates big things, it is often the little things that win our hearts and minds. 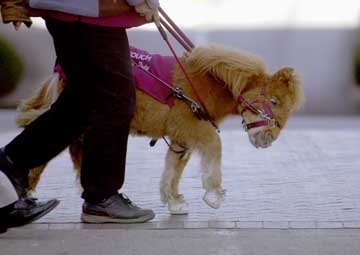 Cuddles is a two-foot high miniature horse that has won over Dan Shaw who lives near Bar Harbor, Maine. 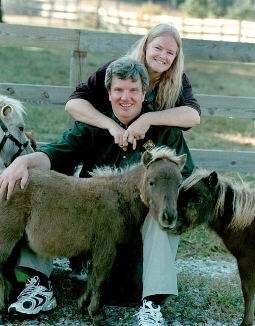 There are an estimated 150,000 miniature horses registered in the United States. A good one costs around $2,000 and they exist primarily for the enjoyment of the people who raise them; but this story is about one of them whose destiny was of a different kind. Cuddles will become the eyes of 44-year-old Shaw. Shaw is an accomplished craftsman and has built beautiful arbors and birdhouses on his property. In recent years, a disease called retinitis pigmentosa has reduced his field of vision to the size of a pinhole. He will soon be completely blind. In spite of his disability, he has used his sense of touch to continue building the arbors and birdhouses which surround his property, and has also built a bait and tackle shop for himself as a place to work near his home. "I couldn't find a way of getting into town to get a job ? but I knew if I had my own business I could do it and run it my way," Shaw says. Around 900 miles southwest of where Shaw lives, in Kittrell, N.C., Cuddles trained to use her abilities as a horse in a new way  as an assistance animal for the blind. Janet and Don Burleson, who also own Arabians, have been preparing Cuddles to be Shaw's companion. 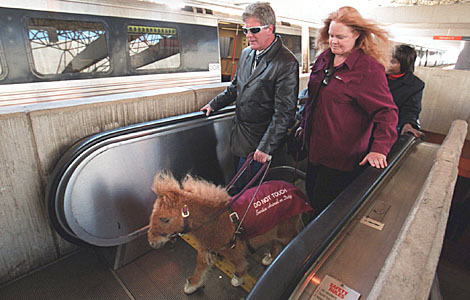 When they got the idea to train miniature horses, the Burlesons had no intention of competing with guide dogs. They only wanted to give more options to visually impaired horse lovers, who in turn will have to supply plenty of grazing space. A visit to the Clermont Stables, which are located in the heart of New York City, further inspired them. They were impressed with the ability of the horses, as they made their way through the busy streets that lead to Central Park. The horses remained calm in traffic and responded to traffic patterns. "They have evolved as an animal that always seeks out the safest, most direct path to get from point A to point B, and they're always safety conscious," says Janet Burlson. 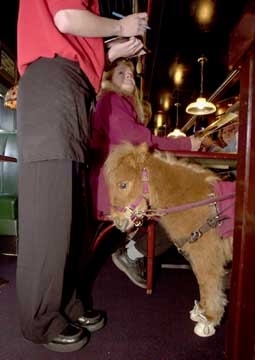 And miniature guide horses can also be house trained. They have no offensive ordor, and they bond well with humans. 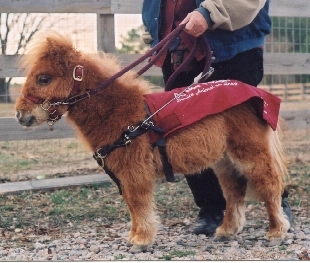 Some of the first miniature horses were said to have been the pets of European royalty. 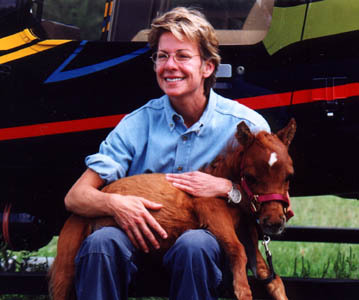 When novelist Patricia Cornwell heard that the Burlesons were training miniatures to use as guide animals, she donated seed money to their program. At precisely the same time, Shaw had finally decided he needed a guide dog's help and contacted the Burlesons. 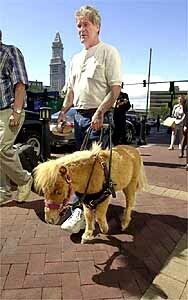 What especially appealed to him was the fact that the same miniature horse could be with him for the rest of his life. 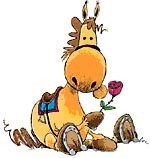 "I've loved horses all my life. It was the idea of them living almost 35 to 40 years, Where I could have one animal and it would last me all that time," Shaw says. 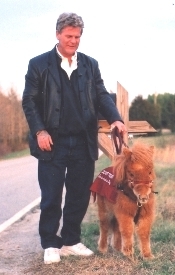 Out of dozens of applications, the Burlesons selected Shaw to be the first person to receive a guide horse, free of charge. He was beside himself with excitement and earlier this month he flew to North Carolina for some preliminary training. 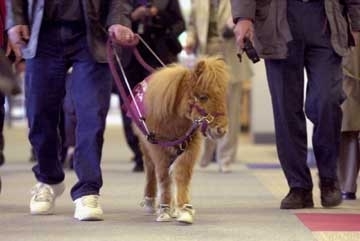 The Burlesons met him at the airport with Cuddles in tow, who was wearing little sneakers to keep her from slipping on the airport floor. "Oh, she's everything I thought she'd be. When I first met her, we hit it right off. It was kind of a strange thing," Shaw remembers, "It was almost like it was meant to be,"
It turned into an extraordinary weekend, in which Cuddles and Dan went through their paces together  including a visit to a large shopping mall in Raleigh, N.C. "When I told her to wait, she would wait. And then when I told to find the button for the elevator, she took me to the elevator and actually stopped in front of the button," Shaw says. Negotiating the shopping mall successfully made Shaw so happy he burst into tears. "It wasn't a cry of, of depression or anything like that, it was a cry of relief and excitement," Shaw says, "It was like having eyes again." 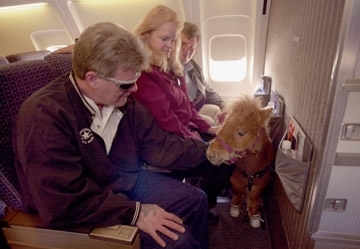 One of his last tests was to take Cuddles on a round-trip flight between Raleigh and Atlanta, Ga. Cuddles took her place in the bulkhead row and was able to take a nap in spite of the shaky floor of the plane. Cuddles will be only 2 years old when she's expected to join him for good sometime in June. In the mean time, there is one more thing Shaw wants to build. "I'm going to build her a little barn with a little corral of her own because I don't really feel you should take away what she really is and that's a horse."